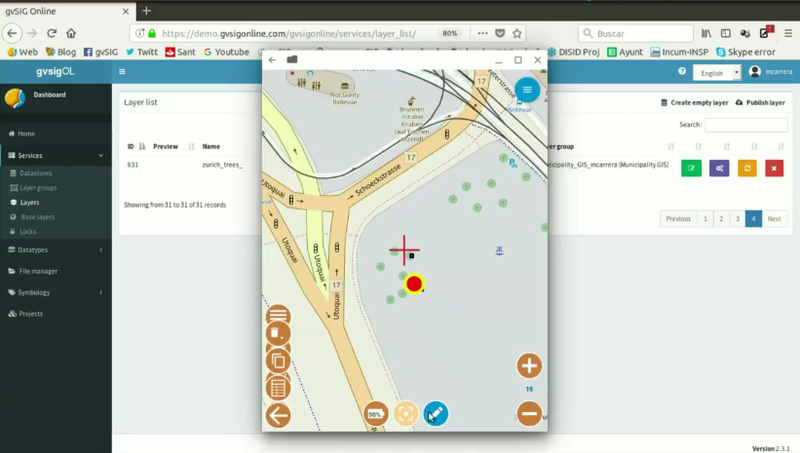 The third video of the sixteenth module is now available, where we will show how to connect gvSIG Online with gvSIG Mobile and how to create enumerations in gvSIG Online. Apart from the functionalities available in gvSIG Online we also have the possibility to connect with gvSIG Mobile, the open source GIS application for mobile devices with Android. Basic editing tools are available from gvSIG Online in our device, even using GPS, as we watched in the previous modules, since it works on a browser. But apart from it we also can work with gvSIG Mobile from our Smartphone, being able to create new geometries and editing their alphanumeric information. If we have the integration between both applications, one of the main advantages of working in the fields with gvSIG Mobile is that we don’t need internet connection to edit our layers. From gvSIG Mobile we can connect to our gvSIG Online server, and download the layer that we want to edit on our mobile device. In this way we can edit it without internet connection, a common problem when we are working, for example, in a mountain area where our mobile is out of range. We would edit our layer, being able to use GPS, and in the end we would save changes. Finally, when we had internet connection, we would upload changes to the server. Once the changes have been uploaded, if the layer was published in any of the projects, the modifications would appear when refreshing. In this module we will also watch how to create enumerations in gvSIG Online. It will allow us to configure a field with certain possible values, so that it will make fieldwork easy when we are working with gvSIG Online. We can configure some values ​​for a specific field, and when editing the alphanumeric data, in that field we will have a drop-down with the possible values, so that we won’t make any mistake when writing. Like in the previous module, you can’t perform this exercise directly, since an implementation of the gvSIG Online platform is necessary, but you can see all its functionalities. In the next module we will see the connection between gvSIG Mobile and gvSIG Desktop, which you can do, since both applications are available to download for free. This entry was posted in english, geoportal, gvSIG Mobile, gvSIG Online, gvSIG Suite, SDI, training and tagged city council, geoportal, gvSIG Mobile, gvSIG Online, municipality management, SDI, Viewer. Bookmark the permalink.